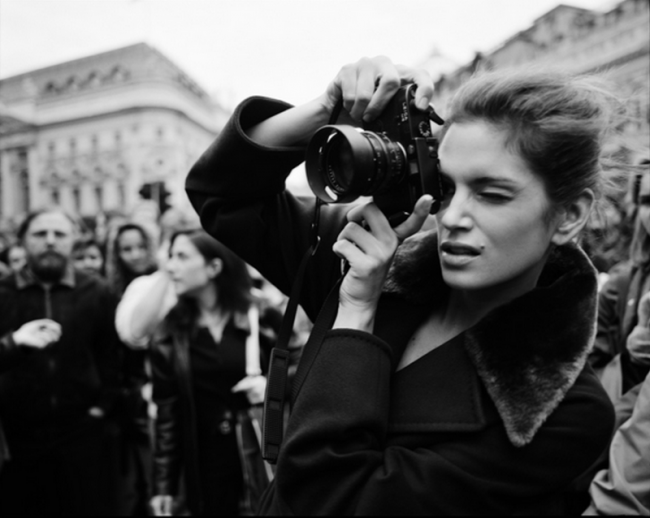 The Women series is a collection of artistic photographs featuring celebrity figures.Cindy Crawford Paparazzi by Michel Comte features the world renowned supermodel behind the camera, for once . Cindy Crawford is the epitome of modern femme in this image. Intimate and direct, the viewer is confronted by the assertive demeanor presented through the central composition and neutral background. The passive woman of traditional fashion portraiture is replaced by an iconic image of the modern woman. Michel Comte eschews cheap tricks and thrills and goes straight for that one decisive moment when a woman’s expression and posture reveal her true inner self in his photographs. Michel Comte eschews cheap tricks and thrills and goes straight for that one decisive moment when a woman’s expression and posture reveal her true inner self in his photographs.Michel Comte’s Women series I and II reinvents fashion portraiture and redefines the subject matter.Michel Comte portrays his subjects with great emotion and intimacy, producing incomparable results in his high fashion photographs.